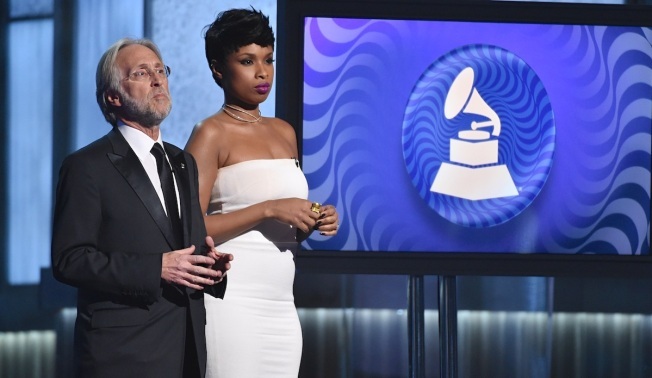 President of the National Academy of Recording Arts and Sciences Neil Portnow, left, and Jennifer Hudson speak at the 57th annual Grammy Awards on Sunday, Feb. 8, 2015, in Los Angeles. While some of the biggest stars of the year were recognized at the 2018 Grammys, there was a noticeable lack of female winners at this year's ceremony. The shortage of female representation was clear even before the award show began as many of the categories were dominated by male nominees, including "Album of the Year," which had four male contenders and one female--Lorde--in the running. As the night concluded, viewers took notice as only one solo female nominee, "Best New Artist" winner Alessia Cara, ultimately accepted a gold statue during the broadcast for one of the top categories. #GrammysSoMale began to trend with fans and observers taking sides on the debate. When asked about the hashtag, Recording Academy president Neil Portnow told Variety, "It has to begin with...women who have the creativity in their hearts and souls, who want to be musicians, who want to be engineers, producers, and want to be part of the industry on the executive level...[They need] to step up because I think they would be welcome." As he continued, "I don't have personal experience of those kinds of brick walls that you face but I think it's upon us--us as an industry--to make the welcome mat very obvious, breeding opportunities for all people who want to be creative and paying it forward and creating that next generation of artists." Meanwhile, the debate has only continued online, with some fans acknowledging the lack of representation while others argued perhaps the best artists this year happened to be men.